"Exceeded Mars orbit and kept going to the asteroid belt," SpaceX rock star CEO Elon Musk tweeted yesterday night (Feb. 6) after a successful launch of his Falcon Heavy rocket from Cape Canaveral, Florida. But that clearly would be too ambitious a feat even for the boundary-breaking entrepreneur. What actually happened is that the rocket overshot its intended orbit and set itself onto a trajectory that would lead it much deeper into space than originally intended, into the asteroid belt between Mars and Jupiter. According to astronomer Phil Plait, writing for his Syfy.com blog, the spacecraft was expected to enter an elliptical orbit around the sun, intersecting the orbit of Mars at its farthest point and the orbit of the Earth at its nearest. "This is a low-energy orbit; that is, it takes the least amount of energy to put something in this orbit from Earth," Plait, who spoke directly to Musk, explained in the blog post from December of last year. "That makes sense for a first flight." Even if the Falcon Heavy entered the correct orbit, the rocket would still take several months to reach Mars. According to estimates by enthusiasts at the space.stackexchange forum, the rocket would have reached Mars at some point in October this year. The flyby would not be particularly close, since the Falcon Heavy's upper stage is not designed to perform any further orbital corrections. It was never intended to actually enter the orbit of Mars — an extremely difficult feat that would require much more complex engineering. 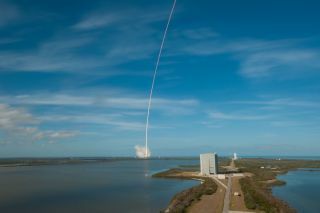 The Falcon Heavy, which is now several hundred miles away from Earth (the minimum distance to Mars is about 33 million miles, or 54.6 million kilometers, though the exact distance depends on the positions of the planets in any given moment), would at some point cross the orbit on which Mars travels around the sun. But the chance the planet would be anywhere near the spot at that time is nearly zero, experts say. Two of the rocket's three boosters landed in sync about 3 minutes after liftoff back at the Cape Canaveral center's landing pads. The third, central booster was later confirmed lost.